Architecture enriches our lives, and the more that the people of Michigan understand its contribution to our organizations, communities and state, the higher the quality of life in Michigan becomes. It is for this reason that the MAF provides financial assistance to organizations and individuals that organize, sponsor and promote events, lectures, publications and experiences that add to the public awareness of architecture. Grants are awarded throughout the year, and are judged by the Board of Trustees Architectural Awareness Committee and approved by the MAF Board of Trustees. To what extent does the program promote an understanding of how architecture enriches lives and the Michigan Architectural Foundation’s mission? How many of the public will likely engage with or receive this program either directly or through media channels? To what extent will this investment attract other resources or other organizations to support the message? How important is the grant money to the organization and its ability to produce the program? What is the likely outcome or result of the program after its completion? Our goal is to make the submission as succinct and simple as possible for applicants. The submission quality is more important than the quantity, so we limit the amount of 8 1/2’’x11” pages you can submit and provide you a required outline for the submission. The letter should include the name of your organization, the name of program, AIA Chapter, Section or member sponsoring the submission, contact information, any partnering organizations involved and narrative that explains how specifically the program addresses the Criteria for the Award and the amount of money requested. Budget — indicate the complete cost of the program and the specific items for which the grant is to be used. The cost to attend or procure, if there is one, should be included. Include all other sources of funds. Communications — describe how the program will communicate to the public, before, during and after the event through both conventional media and social media. Indicate how the MAF will be recognized in these communications. Provide graphic material, photographs or other imagery appropriate to your case for support. Organizations or individuals will submit a brief electronic submission by email to the Chair of the Architectural Awareness Committee. Submissions may be made at any time during the year; however, the Board meets quarterly to approve them. The Chair will forward applications that conform to the Architectural Awareness Committee and they will send their recommendation to the Board for approval at their next regularly scheduled meeting. The Board of Trustees will approve the application and the Chair will notify the recipient within three days of the approval. After the event, the successful recipient will upload the Evaluation Report indicating actual performance of the program and its communication success. Upon receipt of the successful Evaluation Report, the Chair will authorize reimbursement sent to the contact individual. A check will be sent thereafter. Submit no more than the three pages as a PDF to the Chair of the Committee listed above. Please email your Program Evaluation to the Chair of the Architectural Awareness Committee with the following information after the program completion. For architect Bryan Cook, his program to expose minority students to architecture careers is a labor of love. With the help of MAF’s Architectural Awareness Grants, he’s expanded its reach. 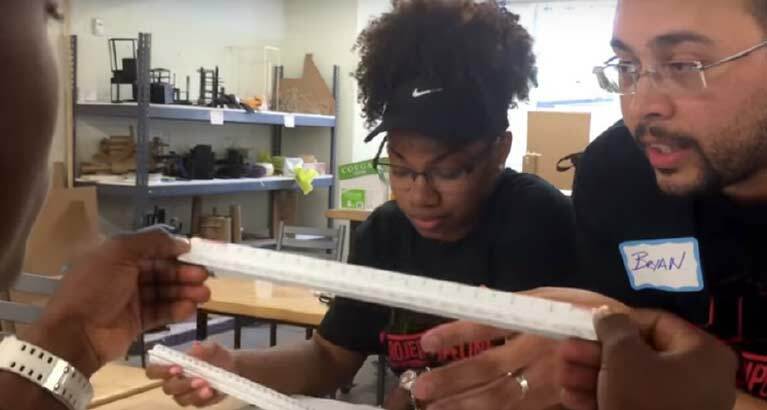 The National Organization of Minority Architects (NOMA) created the Project Pipeline Architecture Camp to help increase the number of minority and under-represented students exposed to architecture and the built environment. Inspired after hearing about Project Pipeline at a national NOMA conference, architect Bryan Cook brought it to Michigan, starting with Grand Rapids in 2013, expanding to Detroit in 2016, and, beginning in 2018, to Flint. The program has been so successful that it has been a grant recipient for multiple years running. Click here to learn more about Project Pipeline.